Aaron Birkby, Entrepreneur in Residence for Steve Baxter’s River City Labs brought a wealth of knowledge and expertise to deliver an inspiring workshop for our local startups on April 6. We had a full house of Coffs Coast entrepreneurs from a range of backgrounds and at varying stages of business development. From people at the ‘before the beginning’ stage with ideas forming to fully fledged Apps ready to launch they were all soaking up Aaron’s in-depth knowledge in readiness to apply it to their business and take the next steps. Demystifying the world of Lean Startup and more importantly breaking down all the jargon so that our local entrepreneurs are best equipped pitch their passion in the Telstra Business Centre Coffs Harbour Digital Innovation Challenge for the prize money and support they need to make it happen (did I mention the $150,000 prize package on offer??). If you are one of these passionate entrepreneurs, it’s not too late entries still open till the 29 May so get cracking. From “the default state of a startup is DEAD” which relates to the fact that a great idea is just that a great idea. Unless you do something, create something and breathe life into your idea it is effectively dead. Which leads nicely into “execution is everything” and then once you have executed…i.e. created something that people can buy into or engage with then it becomes a case of “traction trumps everything”. And as Aaron says, if you get traction then don’t worry the money will find you (if you are looking for investment). If you missed it don’t worry there are plenty of ways to be a part of the action. Telstra Business Centre Coffs Harbour Digital Innovation Challenge 2016 – enter to win prize package over $150,000 in value. Sign up to our newsletters so you don’t miss out again. Come in and visit us at Six Degrees Coworking where you can access all these resources in reality and meet other entrepreneurs. Pitch Pitch Pitch – sign up to Pitch Your Passion on our monthly meetups. Refer to our TOOLS pages for reference guides, videos and handy tips. We do also have FREE access to Pollenizer’s 60 DAY STARTUP online program you can do at your own pace. Despite them both denying any resemblance to rockstars we all thought Nick Herford and Bruno Mattarollo put on a great show at our last 6 Degres Salon for the year. They have both been on incredibly different entrepreneurial journeys to achieve the success they have today. It was great to be able to hear of the differences between Nick being a non-technical founder and Bruno being a co-founder and the CTO (Chief Technical Officer). Nick Herford, is the Founder of Hello Claims. After many years working in the insurance industry Nick has used his knowledge of unmet customer need and turned it into a startup ready to disrupt the industry and turn it on its head. In the space of 18 months Nick has been able to develop the concept, combine his skills with someone to build the machine behind the scenes to make it all work, on-board 15o panel beaters from across the country and run successful pilots with a number of big name insurers which have translated into exclusive contracts. With strong ties to the region he is passionate about keeping the business local and growing his local workforce, their expansion plans identify the need for 30-40 staff in the future. The success of his business is not going unnoticed by investors, he has already had very lucrative offers. His heart is definitely connected to this place as he has declined a recent investor when the deal breaker was their insistence in off-shoring the workforce. Bruno Mattarollo, co-founder and CTO for Waysact, a startup providing services to international big name charities that has bootstrapped itself to success. A self confessed computer geek he has had an international journey starting in Argentina cultivating his programming skills, moving to Europe to work with Greenpeace and then to Australia in the early days of Pollenizer (a tech startup accelerator). Combining his tech skills with his knowledge of the fundraising industry is what landed him as a co-founder in Waysact. It has grown over the past 4 years exponentially, being totally bootstrapped the whole way (self funding = no investor $$). Starting with an early stage pilot with their first client in the first year , this has quickly has grown to their product now being used in 17 countries in 15 languages. With this growth has come the need for a diverse team – and this is truly diverse team, 20 people distributed on all points of the globe! There are similiaries though. They both have used their inside and deep knowledge of niche industries and identified unmet customer needs. Both their products deliver value to clients by streamlining existing processes, eliminating processing time and other variables to ultimately reduce costs. Waysact effectively reduces the cost of client acquisition by reducing input errors and the lead time from donors signing up to funds being transferred to the charities. Both these areas traditionally lead to charities losing donors, which is a significant issue. With a the average donor spporting a charity over 5 years – it could represent up to $2,000 of lost opportunity. Hello Claims is so confident of being able to save their clients significant dollars that they have built it into their business model. They get paid based on the amount of savings they deliver to their clients. We had a very lively Q&A session from our 6 degrees members and I do believe we could have gone on for hours! 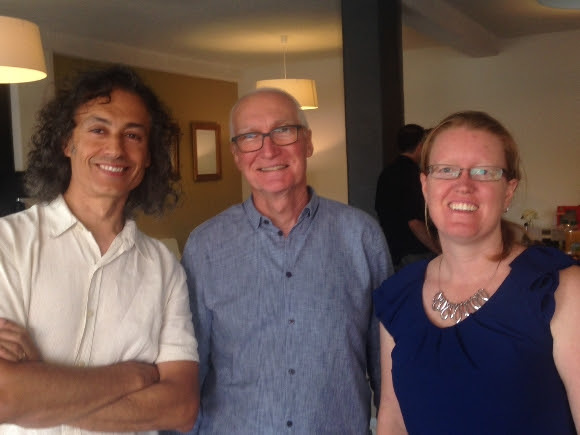 We are all very grateful for Nick and Bruno for sharing their journey with us and I look forward to hearing how they have inspired others to take the steps to make their audacious plans for 2016 a reality. Thanks to everyone who have made it an awesome year for 6 degrees this year and we shall see you back again in 2016. 6 degrees coworking @ Innovation Centre – open Monday – Friday for you to sign up as a regular user or drop-in when you need to. 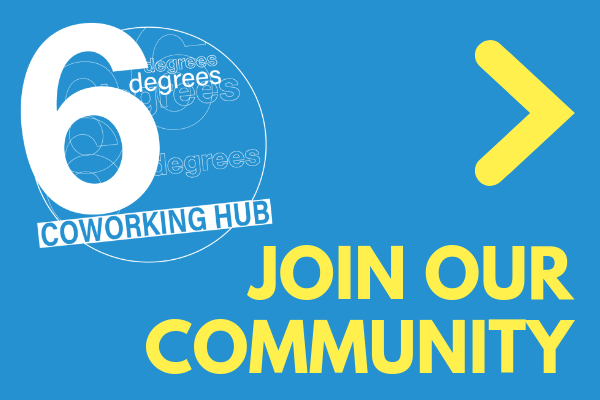 6 degrees coworking @ City Square – Tuesdays only at the Coffs Coast Community College 9 – 5pm for members. FIRST PITCH SESSION FOR 2015! Nancy Sposato – exploring the intersection between the creative performing arts and business. Phillip Babbage – is PCB Architectural Drafting. Having spent the last couple of years establishing the viability and reputation of his Building Design and Drafting business, Philip is looking to grow his business. Everyone is welcome to come along and be inspired, support, provide feedback and connect with our exciting entrepreneurial members. This event is open to all so spread the word and make an effort to get in here if you haven’t already – it is a must not miss experience – the buzz and excitement from seeing and helping people realise their passions.